Deprecated function: The each() function is deprecated. This message will be suppressed on further calls in book_prev() (line 775 of /usr/share/drupal7/modules/book/book.module). Long gone are the days of bull baiting, and with them the once vicious and aggressive characteristics of the bulldog’s ancestors. Today’s modern bulldog is distinguished in its adorable appearance and generally agreeable demeanor. But let’s get a little more specific. While at first glance the bulldog may look tough, its large head with a small face often inspires awwws from adults and giggles from children. The bulldog’s signature wrinkles add to the adorable factor, along with its stocky build and side-to-side, shuffling gait. The bulldog has straight, short hair, usually of a fine texture. In healthy dogs the hair is smooth and glossy. The dog’s skin is typically loose, forming those wrinkles around the head. Most bulldogs also sport a dewlap -- two folds of skin along the throat from the jaw to the chest. As for hair color, there are many varieties. According to the American Kennel Club, desirable colors include brindle, white, red, fawn, fallow, and piebald. The bulldog is a medium-sized dog, with adult males weighing about 50 pounds and females about 40 pounds. The dog’s strong limbs and stocky body give it its sturdy appearance. Healthy bulldogs generally have a kind and resolute demeanor, though the specific temperament can vary depending on the specific breed. They tend to be courageous, dependable, and protective, but not vicious or overly aggressive. These traits are most developed and consistent in dogs whose owners are dependable and consistently dominant. Bull dogs with skittish owners may feel the need to become the leader of the pack (and in the case of a pet bulldog, the pack is its home and human family), which can bring out some of the aggression seen in its ancestry. So, it’s important that bulldog owners of all breeds make sure their pet knows that they are in charge. Bulldog puppies, like many puppies of all breeds, can be highly energetic. Growth spurts and getting used to so many new people as they are socialized add to this. As a bulldog ages, his energy typically slows down quite a bit, and he will often spend long stretches of time napping and relaxing. 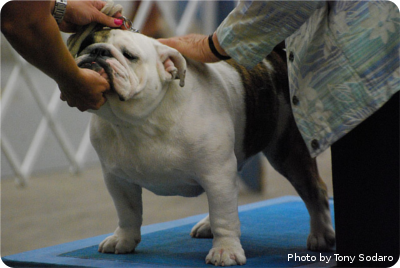 Most bulldogs will need some owner-initiated exercise, especially as they age. Walks in the morning or evening (or otherwise mild weather) should do it. A bulldog’s relationship with other dogs and animals can vary depending on the breed. Again, you never want a bulldog to feel that it needs to be the leader of a pack, so if they are around other dogs that they feel the need to dominate, they may become aggressive. Some male bulldogs will show aggression toward other male dogs, and some do not mix well with cats. Some breeders recommend that you never feed a bulldog in front of other animals. Many bulldog breeds make wonderful pets, as they are often loyal and protective and build strong bonds with children. While energetic young children can alternatively excite or annoy a bulldog, he would typically need to endure very aggressive teasing or provocation to be aggressive back. That said, aggressive behavior in bulldogs cannot be completely ruled out, and once a bulldog decides to attack, it is very difficult to stop him. So, while healthy, well-trained bulldogs can be among the best family pets, great care should be taken to select the right breed, train them well, and maintain strong owner dominance. And of course, adult supervision is always a must when children play with bulldogs, as with any animal.